Reupholstering means restoring a piece of furniture by giving it new fabric and stuffing. If you are reupholstering your entire couch, why not do the decorative couch pillows as well? By using new fabric and adding a little extra stuffing, you can create all new couch pillows using the same measurements as your old pillows. While reupholstering a couch is another story, reupholstering the couch pillows is actually quite simple and can be done inexpensively at home. 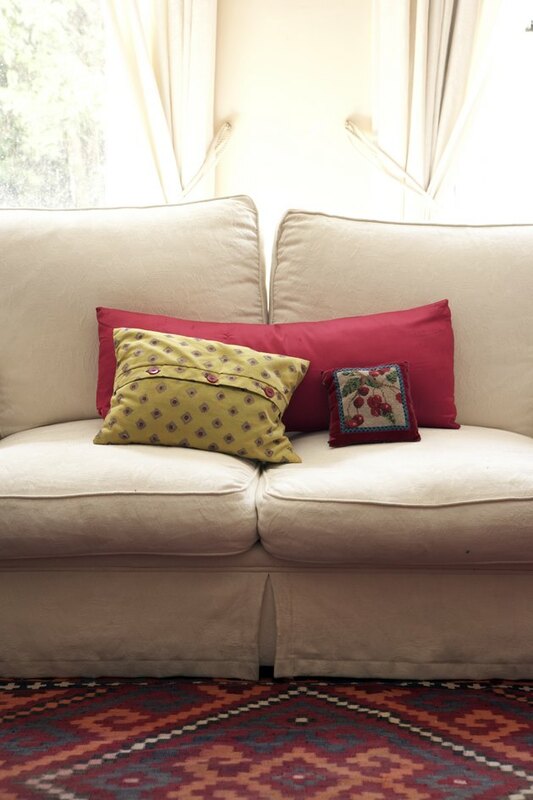 Reupholstered couch pillows can help give your couch a fresh look. Trace the size and shape of one of the old couch pillows on a sheet of newspaper with a marker. Add an extra 1/2 inch around the entire perimeter to allow room for the seams. Cut out the shape of the pillow. Use a seam ripper to cut through all the threads on one side of the cushion to open it. Remove all the stuffing from inside and discard the fabric casing unless you wish to save it for another project. Fold the fabric in half and attach the newspaper pattern to the fabric with sewing pins. Cut the fabric out around the pattern. You should be left with two identically cut pieces of fabric. Place the two pieces on top of each other with the right sides together. Sew three sides of the perimeter together 1/2 inch from the edge using a needle and thread or a sewing machine. Match the color of the thread to blend in or match the fabric you are using. Begin to bind the final side of the pillow case with the needle and thread or sewing machine. Knot the thread and cut away the needle when there is 3 inches of space left to be sewn shut. Pull the pillowcase right-side out through the hole. Insert the old stuffing from the previous pillow into the opening if you want to re-use it. Fill in the empty spaces in the pillow case with synthetic or cotton stuffing or foam stuffing balls. Use a ruler to push the stuffing into the corners of the couch pillow. Sew up the remaining 3 inches of the pillow. Knot the thread and cut the excess away. Can a Full-Sized Comforter Be Sized Into a Twin?